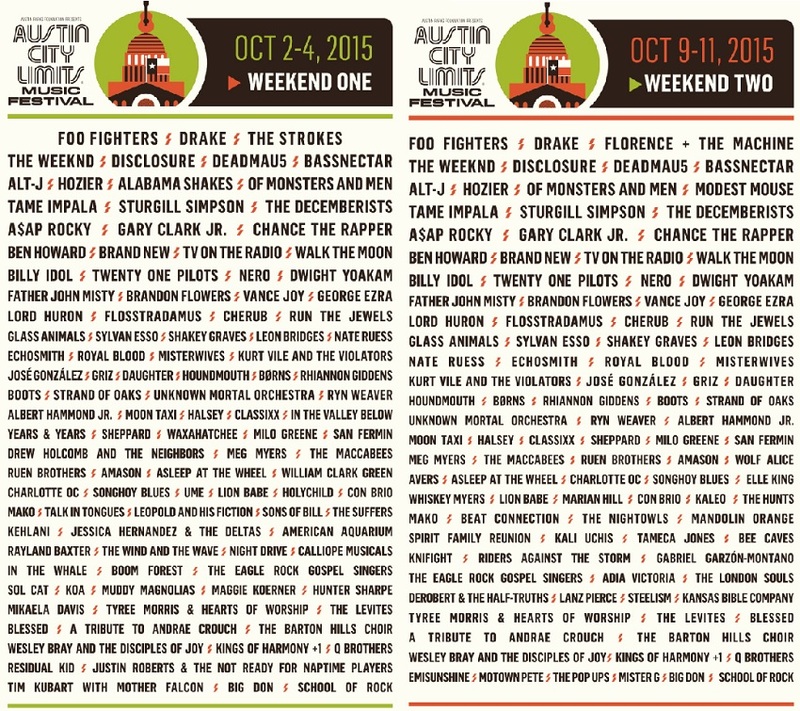 ACL Festival takes place on 46-acres in Zilker Park, the crown jewel of Austin's public green spaces. It plays host not only to 130+ artists from across the globe, but amazing local eats and wares, free fun for the kiddos, green goings-on, and other cool activities to entertain you between sets! Weekend one ft. Foo Fighters, The Strokes, Drake, The Weeknd, Disclosure, Tame Impala, Alabama Shakes, Alt-J, The Decemberists, Chance the Rapper, ASAP Rocky, Billy Idol, Run the Jewels, TV on the Radio, Brandon Flowers, Brand New, Father John Misty, Kurt Vile and the Violators, Gary Clark Jr., Royal Blood, Jose Gonzalez, and Daughter, along with deadmau5, Bassnectar, Hozier, Of Monsters and Men & More! Weekend two ft. Foo Fighters, Drake, Florence and the Machine, The Weeknd, Disclosure, Tame Impala, Modest Mouse, Alt-J, The Decemberists, Chance the Rapper, ASAP Rocky, Billy Idol, Run the Jewels, TV on the Radio, Brandon Flowers, Brand New, Father John Misty, Kurt Vile and the Violators, Gary Clark Jr., Royal Blood, Jose Gonzalez, and Daughter, along with deadmau5, Bassnectar, Hozier, Of Monsters and Men & more!